Now, don’t get me wrong — the kids were not the problem. Having each of my babies has truly been, hands down, the most spectacular moments of my life. My evolving crisis was entirely because of ME. The problem is, it’s impossible to try to be perfect when you’re sharing your life with small people. Oh, I tried to do it all. I tried to make time for my friends, to be the perfect wife. I tried to keep every stitch of laundry clean & folded. You know, the other people who lived with me. The people who left crumbs everywhere and spilled drinks all the time. The people who whined instead of asking cheerfully. The people who used rude words instead of being kind to their sibling. The people who seemed to require more of me than was left inside. The people who didn’t seem to notice how hard I worked for them, how much it took from me, day after day. I was tired. 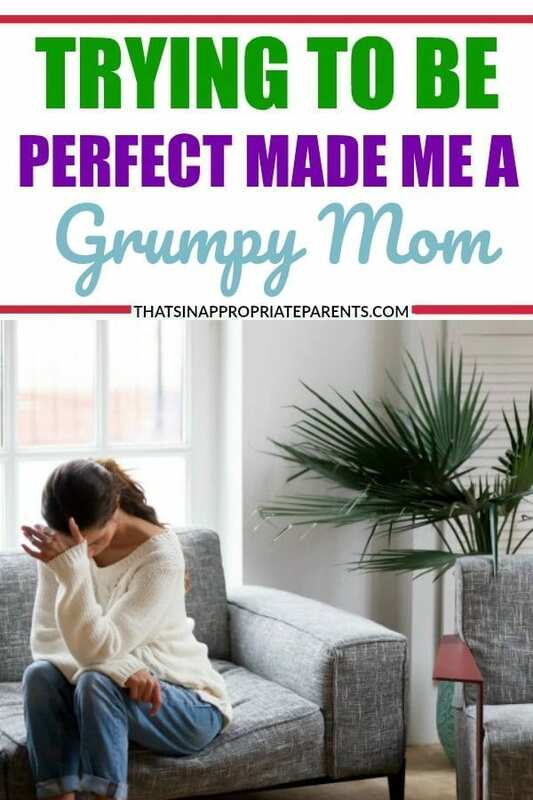 I was grumpy all the time…from the pressure I put on MYSELF. But it wasn’t just THE STATE OF THE HOUSE that stressed me. I also had private worries about how my kids would perform in school. Parent-teacher conferences that involved less than stellar reports crushed me inside. And none of it was about competing with other moms; it was my own internal competition. Am I good enough? Am I doing this right? Am I being the best mom that my kids deserve? Is my husband proud of me? Is my house clean enough? Are my kids clean enough? Are my kids happy/well-adjusted/well-balanced/in enough activities/in the right activities/learning the right character qualities? Do people look at me, with six kids, and think, “She’s in over her head”? But thankfully, I began to see my problem before screwing up my kids. Well, in this respect at least. I’m sure there are countless other ways I’m inflicting psychological damage on them. You know, the serious stuff, like not buying them iPhones or making them share a room with a sibling. The horror! As a teacher, it was so easy to receive validation, literally, in the form of evaluations. It was concrete proof that I was doing it right. But as a mom, there’s no grading system. There’s no report card to indicate how well you’re doing. Or more importantly, no clear-cut system to affirm that, yes, YOU’RE DOING A GOOD JOB — especially on those days when it crashes and burns. You know, the days when the kids are late to school because you can’t find a shoe, or the lunch money, or whatever it is. The days that you find toddler graffiti, in marker, on a freshly cleaned wall. The days when dinner is late, or when dinner is hot dogs, again, because you just don’t have it in you to do more. The days when you scream in total overreaction not because the child deserved it, but because you’re just so tired. The days when you weep because the house is a total mess, and you’re convinced any mom would do it better than you. Those days are so not perfect. The truth is, life is messy. And it’s even messier with kids. It took me a long time — too long, really — to realize that there’s NO SUCH THING AS PERFECTION. And attempting to reach it, particularly with kids, is, in the words of the great Phyllis Diller, “like shoveling the walk before it stops snowing.” In other words, it’s pointless. I’m slow to catch on, but I’m getting it. I sweep less, and I hug more. I scrub less, and I laugh more. I’ve also gotten the kids into the work, which is a big help. I worry more about what my kids think than what other moms think. I guide & encourage, but I let each of my kids grow to be who they are meant to be, not who I thought they were supposed to be. Because ultimately, my kids won’t remember how clean the floor was, but they will remember how I loved them and made them feel.